When I left my real home in Western PA and drove across the US of A to get to Tucson, AZ, I had no idea I would soon hold this place in such derision...and, with such contempt. I have always considered this city to be my adopted home. I lived here for six years and loved the place. I even made a return--for family reasons--in 2002. But, within the last six years or so, after careful observation, I've changed my opinion. It wasn't just what I saw here...but more what I saw in other places I've visited. I've got a lot of problems with this "big city that thinks it's a small town", and its primary focus of--itself. Let's start off with something simple...the coverage of the University of Arizona (UofA) athletic program, to the exclusion of most anything else sports- (or sometimes news-) noteworthy. There have been times when there was something HUGE going on in the REST of the world...but noooo, we have to watch the coverage on the 10pm news of the upcoming UofA NCAA Football season...in June. The Arizona Diamondbacks have just won a crucial game in extra innings against a popular division rival...the Detroit Red Wings have won the NHL's Stanley Cup...but none of that matters. Wouldn't we rather see the UofA Women's Volleyball highlights? It gets worse. If there is any connection between an athlete or celebrity and Tucson, you can damn well be sure we will know about it. If a player hits a home run in the World Series and by chance he attended Tucson's Sabino High School, don't be surprised if they don't interview his high school coach. And you didn't want to be here when the Mars Rover was launched...being as much of the work was done right here at the UofA. Believe me, I'm all for coverage of science and technology...but not to lead off the news ("the Rover moved three feet today, thanks to efforts by UofA scientists")...when the national story should be about, say, California falling into the ocean (oh, and "the UofA sent a science team to investigate the strange disappearance of the Golden State..."). Yeah, well I know...civic pride and all that. Well, huge cities like Los Angeles or Dallas seem to be able to strike a balance between local and national...and I've not seen it this bad (read: self-serving) anywhere else...and I've been all over, 10 times as many small towns as large cities. You would think that everything either starts here, ends up here, or passes through here along the way. A friend of mine and I have a typical joke about what that's like, a possible story on the Tucson news..."Lance Armstrong is on his way to winning his record seventh Tour de France. Armstrong once drove through Tucson, on Interstate 10, and stopped for fuel. The owner of that station remembers...."
Yeah yeah I made that up. But there's real, more scary examples. Here's another thing I really dislike, with more substance than just my perception of its self-service: the mistrust and dislike Tucson has toward other communities...and the downright stubbornness of this town to change and/or improve. For one--the people that run this town are scared of freeways. Scared to death of them, apparently. it seems as if there is a strong fear this town will turn into a metropolis the size of Phoenix instantly, should any appear. The city of Tucson has built several "highways" that have red lights on them...without these signals these would be something approaching "real" freeways. Well, we couldn't have that. Sooo...these roads have become a barely acceptable means of getting around. And the speed limit on these roads, which are steadfastly ignored as impractical by all but winter visitors, who actually take them seriously? Why, a breakneck 45 mph. Why would anyone want to drive faster than that, anyway? It was fast enough for our grandparents in 1930...it should be fast enough for us, by cracky. Recently ADOT (the Arizona Department of Transportation) was forced to improve a freeway exchange on the only real freeway here and the one the city can't put red lights on, Interstate 10. The overhaul of this exchange was necessary, as it connects I-10 and I-19, which is the Interstate that goes into Mexico. The cloverleaf construction of the old interchange forced people to go 25 or 30 miles per hour through the exit, or much much slower when there was more traffic...vehicles backed up, there were accidents, it was a mess. With the new interchange, these problems are alleviated. It seems, after all, that there are some drivers--Communists and Socialists and liberals and snooty Eastern types and tourists and Foreigners and people from that Great Satan, Phoenix--that insist on driving faster than 45 miles per hour. Why, we should lock them all up! Special Notice to the City of Tucson: Listen up--CITIES DO NOT STAND STILL (as much as you might want them to)...like fish, THEY MOVE FORWARD OR THEY DIE. Finally...well, for this entry, anyway...there was a study done here by the local newspaper, comparing Phoenix and Tucson. It was not popular. 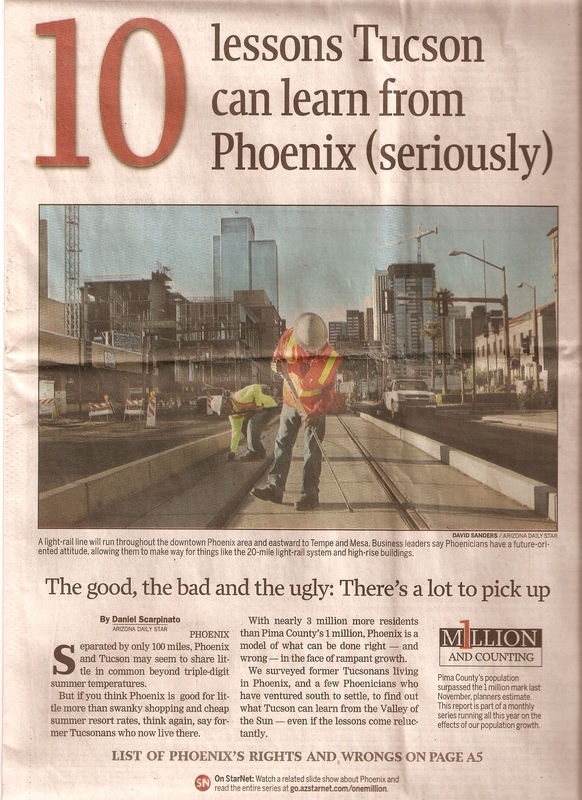 After considering all the economic, transportation and social factors...Phoenix won out easily over Tucson (although it was acknowledged that not everything is perfect there, either). Just another reason to believe Phoenix is the Great Satan, a big bully come to steal Tucson's lunch. For years, there have been stories in Tucson newspapers of Phoenix taking Tucson's state funding allocation...its CAP (Central Arizona Project) water allotment...its funding...its people. Threatening its very existence. Phoenix cares nothing about any of that. 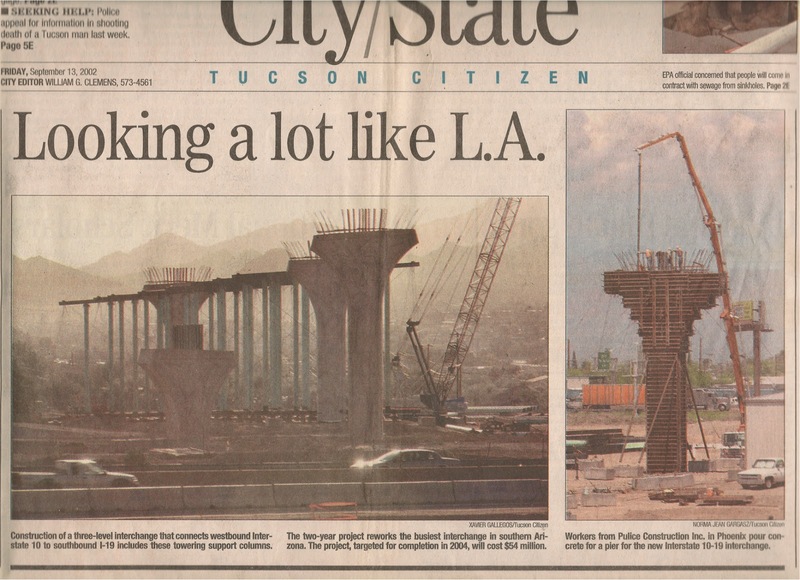 Phoenix knows that it cannot become Los Angeles...as unlike L A it carefully planned out its freeways 30-40 years ago, in preparation for its growth. While it admittedly might become huge, in the end it will at least be better organized. 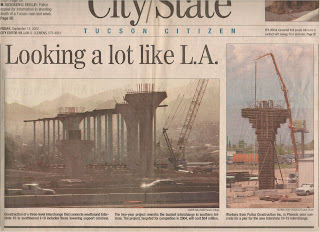 Tucson has no plans for its growth...for example, there is no easy way to get from one end of the city to the other. An example of its poor planning: there is a parcel of land just to the west of Downtown, across I-10, in a historic district that has since fallen on hard times, and that has supposed to have been a number of things for years...a research park. A historical re-creation of Tucson centuries ago. An entertainment district. The city passed a Bond Initiative to gather funds for whatever it was going to do there. Well, discussions were held...and, finally, a decision was made. Only now, years later, the costs have outstripped the funds the City has been given by the voters. So...not enough money, no project, no action taken...the land sits. Oh, and did I mention? There's no traffic signals on any of the freeways in Phoenix. And, the speed limit on most of them is 65 MPH. Oh, my. What is this world coming to? Okay okay, so it's been awhile. Well EXCUUUUSE MEEEE for LIVING my life instead of sitting in front of the computer, all the time. Here's some loose ends to clear up...first off, remember that emotional post back last June, about how I WANTED TO BELIEVE? Well, for those of you that read it, forget all that. I guess you could be critical and say that I was an idiot in the first place for even thinking whatever I was thinking at the time, that it might actually work. Okay again...guilty as charged. This posting is about Wonderful Things...but that sounds like a weenie title, so I won't use it. I could have a Wonderful Thing going on right now...and, no details. It is what it is...and what it is, could be...wonderful. KC knows...or, should. And will. Another Wonderful Thing is--SURPRISE! It has to do with computers. Specifically, Macintosh computers. I have left the PC world...for good, this time. I lugged around my Dell Inspiron 8600 laptop for years...then, last October, I got a Mac PowerBook G4 from one of the former Best Places on Earth, the ASU Surplus Warehouse in Tempe, AZ. Readers who want to look back on here a bit will read how I've praised them before. They don't sell Direct any more, only through Online Auctions...another Wonderful chapter of my life, closed. I owe them a lot for what they provided me, starting 10 years ago. Wow...ten years! Anyway, it wasn't much, but it was my first next generation Mac. That was the start...gradually, I found things and workarounds, ways to use it instead of the Dell. See, it's this way...when you first started using computers years ago, you thought "Wow! This is pretty cool!" Well, after a few bouts with Windows, its at-times unfriendly interface and its problems and little idiosyncrasies, a lot of the novelty (and fun) probably wore off. Well, PSSST! It's still there...on a Mac. No hassles with Operating System problems...like they say, it just...works. They now have Macs that run both OS X and also run Windows...but I will GUARANTEE that once you use Mac OS X, you will use Windows less and less. I know...I did. There's a few more Wonderful Things to tell you about...I also am back "in circulation"...but this doesn't mean that I'm actively seeking anything, though, Out There. I am traveling a lot these days, I'm only home a few days a month...and for the most part I stay in hotels that have restaurants and "lounges" (I love that word..."Let's go have some drinks until we can't stand or sit anymore, then we'll LOUNGE...!") So, I go there often...the restaurants I mean, but sometimes the Lounge. It's a great way to unwind and get out of the room for a while. So, "in circulation" means getting out in public, and not just getting takeout and going back to the room. In fact, I'm writing this from the Lounge of the MCM Elegante hotel in Albuquerque, NM. They give us two free drinks a night, and a Free complimentary hot breakfast buffet ("gratuity not included"). That should be a Jimmy Buffett song..."two free drinks, and a Complimentary Hot Breakfast Buffet!" Gratuity not included. Please, take care of those...that take care of you! In addition, there's this great job I have now...that's another Wonderful thing. More on that later, though...that's a whole 'nother Post. And...the last Wonderful Thing here, for this post...Blake's Lotaburger! Chopped Green Chiles! Bacon! Extra meat, and extra cheese! And, only in New Mexico! Since July 9, 1952. This state might be backwoods and backwards, but they do have Blake's, New Mexico's answer to In-N-Out Burger. But of course we all know...there is no substitute for In-N-Out Burger...but, it's very close.